Nice large pin with the most unique color stones. 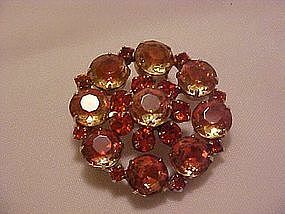 All of the large rhinestones are a dark peach in the center fading to amber on the edges. All of the smaller stones are a solid orange color. rhinestones are prong set in a goldtone setting. It measures 1 3/4" in diameter. Very nice condition with a nice tight pin back. No makers nave that I can see. 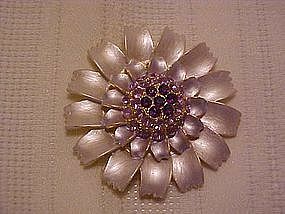 Pretty floral pin with big pink stones for petals and smaller white rhinestones set in a starfish formation around the petals. Silver tone setting, and all stones are intact, and the pin back is very secure. The pink stones appear to be plastic or lucite. No name on this one but its very pretty. Measures almost 2" in diameter. 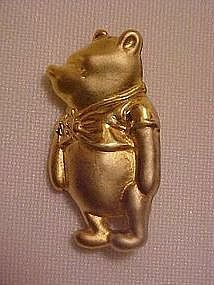 A nice classic winnie the Pooh pin marked Disney VO.8.8 on the back. Measures 1 1/4" tall, and he is truely adorable. 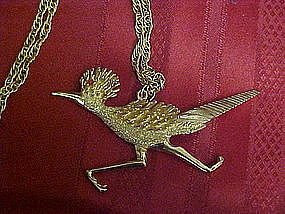 Made of heavy gold tone metal and is finely detailed. Excellent condition too! Deep smoky gray rhinestones accented with smaller clear rhinestones make this a very pretty ensemble. 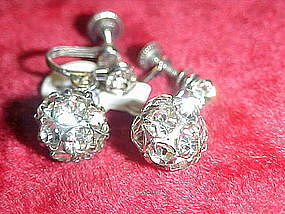 Prong set rhinestones set in silver tone metal. Pin measures 1 1/8" by 1 5/8" an matching clip on earrings measure about 1/2" by 1/2". 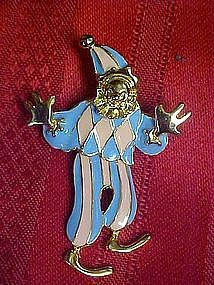 Backs on earrings as well as the pin are nice tight, and secure. Excellent condition! NO Name. 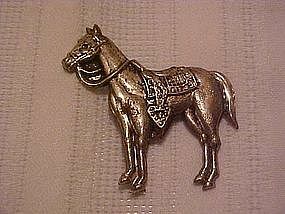 Old horse pin is made of a type of stamped heavy tin material. Stamped Japan.This actually looks like Roy Roger's horse, Trigger. Silver color and measures approx 2 x 2. Great condition. 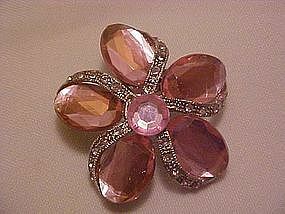 Nice large flower pin that looks like it's a mum. Gold tone setting with soft sheen silvery petals and rhinestone accents. No name on this one. Measures approx 2" in diameter and is in very nice condition. Very unusual string of beads. 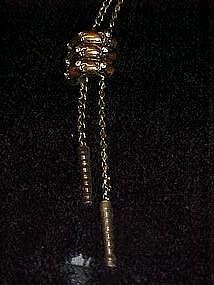 Strand hangs to a length of 14 1/2 inches when clasped closed. Screw clasp. 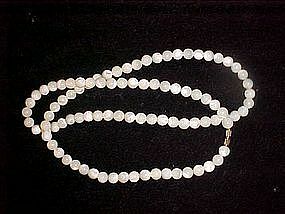 Each bead has a beautiful mother of pearl sheen and irridescence which appears almost opalescent. A wonderful set of beads and very heavy.I tried to show a closeup of the beads in 2nd photo. Sweet little costume earrings made by Coro. 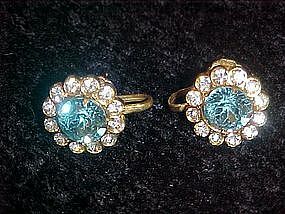 Pretty, prong set, blue topaz center rhinestone surrounded by clear accent stones. 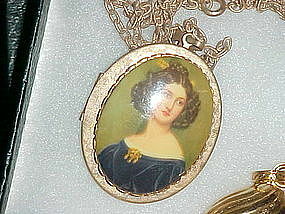 Measures 5/8" in diameter and is set in a gold tone setting. Screw backs, Excellent condition. 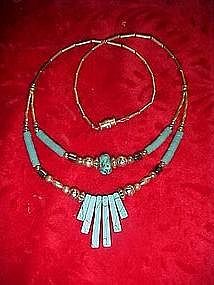 Nice indian style turquoise, and silver bead necklace, with some hemotite beads also. 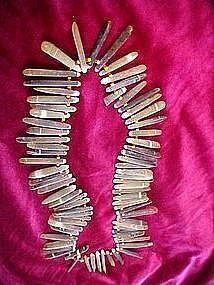 Screw clasp, and entire necklace in in very nice condition. A very nice style that is being worn again! I have a closeup of the detail if interested, email me. This bolo tie is made of metal and is a copper tone color. Embellished with star decorations and a white rhinestone in the center of each star. Braided black & gold bolo. Metal bolo tips. Very nice condition. I actually have two of these identical. They were used by a couple who square danced. 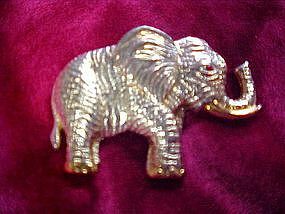 Nice large gold plated elephant pin, It has a ruby red rhinestone eye. Clasp is nice and tight and all is in excellent condtion. Measures 1 1/4" by 2 1/4". Elegant vintage earrings by Carl-Art Inc. since 1937. 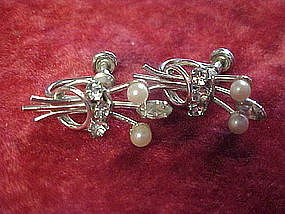 Sterling silver, real pearls and good quality rhinestone crystals. They measure 1" at the longest point to point. Immaculate condition. Marked sterling and CA with the arrow logo. 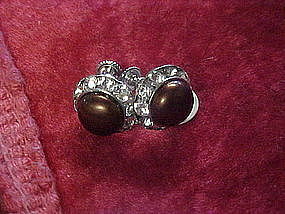 Adorable vintage earrings would be a perfect size to wear with most anything. 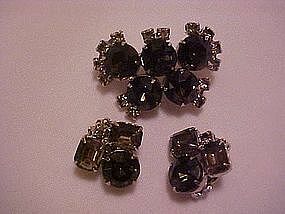 Screw backs, brown centers surrounded by brilliant crystal rhinestones. 1/2" diameter. Lovely condition!